Fortune awakens to a call from the Latverian airport director. He complains that a load of Cyber-junkies are arriving at his airport under Doom's authority. Meanwhile Doom makes plans with Paloma who warns that she cares not for what he does in the real world, but if he harms cyberspace, "there will be death." When Fortune arrives she finds that Doom has indeed hired the services of Net Gliders for purposes unknown. In the background, news channels are alive with reports that Latveria's neighbor, Makhelastan, has erupted with revolution. Fortune returns home to sleep. The next morning, Fortune attempts to ask about the Net Gliders, but Doom evades her and orders to take care of pressing matters of state. Doom rides up to the Liebra Cielo to hold closed-door meetings with the Net Gliders and others. Fortune is met by the Chief of the Guard, Latveria's police. He reports that Chain, a highly addictive drug, is being dealt in the Riverfront area. He suspects a Drug War may soon erupt. 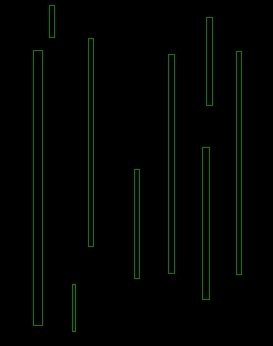 After he is dismissed, Poet reveals to Fortune that he was once a chain user. Since quitting, he's made it a personal mission to eliminate it wherever he finds it. Poet tells Fortune to have the guardsmen meet him at the Riverfront. However Poet enters alone and bursts into a Riverfront bar. A shootout ensues where Poet manages to kill a number of dealers. But a stray explosive from one of the dealers throws him off balance. Majick, the lead chain dealer, puts a gun to Poet's head, point blank. Later, Fortune tearfully looks away from Poet's corpse. A policeman's jacket placed over his head. The police commander attempts to console Fortune and tells her that they were only a minute late. Valhalla is renamed Libera Cielo - Latverian for "Clear Sky"
Poet's final appearance. 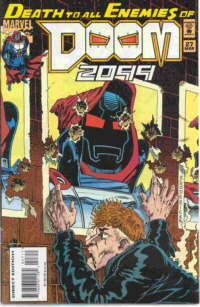 Doom does however attempt to resurrect him for Fortune, see 2099 A.D.
Doom releases Environmental Maintenance Platforms to purify Latveria's air. Doom first saw EMP's used during his visit to Wakanda, during which he managed to palm information from their databanks. Another cover was created for this issue, but went unused. Click here to view the cover. Riots continue in Makhelastan following a revelation that the state and population are the property of the American corporation known as Angel's Breath. In Latveria, Doom and Fortune attend Poet's funeral. The funeral is made into a state event. Though Fortune appreciates the gesture, she asks Doom why not honor him the Zefiro way. When Doom introduces her to one of Poet's info-brokers, it becomes clear that the funeral was a front for Doom to meet Poet's contacts. Meanwhile, in cyberspace, Duke Stratosphere observes an unusual sight, Net Gliders moving in formation like soldiers. In Columbia, Dr. Jose Flieschmann uses cyber-necromancy to bring Wire back from the dead. Back at the Riverfront, the chain pusher who killed Poet, Majick, enjoys the status he has gained after killing one of Doom's men. Suddenly Doom bursts in, blowing a hole in the wall of the bar. He tells all of the customers that he has been killing people all night. If they wish to live, they should tell him where he can find Majick. The crowd points him out and run out of the bar. Doom throws Majick out into the streets and kills him publicly for all the Riverfront people to see. He then invites the people of the Riverfront to become his subjects and follow him. Later, aboard the Libera Cielo watches Makhelastan revolution unfold. Wire is brought back to life (flesh). 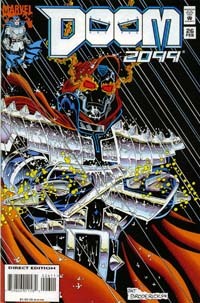 He was last seen in Doom 2099 #25 existing as pure data in Cyberspace. Tiger Wylde's building is converted into the Central Refuge Hostel for those leaving the Riverfront. Ironwine, director of the Latverian airport is called in when an immigrant arrives from Columbia. To his surprise Doom is there and the immigrant is Wire, freshly brought back from the dead. Ironwine is then called to the airport tower where he is told that machinery installed by the Mercenary Guild has taken control of air traffic. Suddenly Merc ships decloak and land on the runway. Elsewhere, Doom questions Wire about his experience after his death. Wire reveals that he was with Paloma in cyberspace. This confirms Doom's theory that his mind exists simultaneously in both worlds. In Cyberspace, Communion Jack eavesdrops on a meeting of the directors of Angel's Breath, the American Megacorp which owns Makhelastan and its population. The directors decide to do to Makhelastan what the Narco-presidente did to Bogota. Aboard the Libera Cielo, Nkrumah, leader of the Panther's Rage arrives with his troops and offers his loyalty so long as the money lasts. Sharp Blue brings Doom his final 'ally', Morphine Somers, a mutant activist. News breaks that the US is necrotoxifying Makhelastan turning it's inhabitants into toxic sludge. Fortune enters as the footage is broadcast. She is shocked when Doom reveals he instigated the revolution and demands to know why. Doom then commands Nkrumah to restrain her with a view to severing her windpipe. He forces her to confess that she offered her loyalty the Neon Angel in exchange for the restoration of her brother Kaz's mind. He expresses his disappointment and questions whether he can leave Latveria in her hands. Doom proceeds to explain the reason he has brought them all together. Nkrumah, Sharp Blue, Indigo, and Morphine will be his Black Cabinet in his plan to take over America. 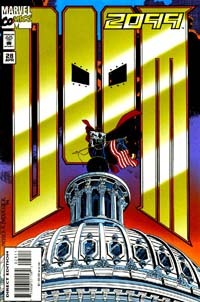 "I chose not to pursue [Doom's mystical side] because, ultimately, the magic stuff wasn't as interesting to me (in this instance) as the political stuff. I wanted to write a piece of political sf, so I kind of ignored the magical side of Doom. I felt it was more important to drag a REALLY ignored side of Doom into the limelight -- his revolutionary aspect.."
As with #26, a different cover was originally made for the issue. 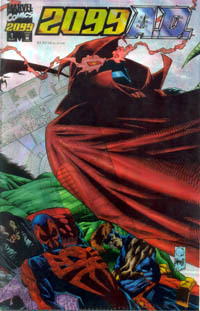 The unused cover was inspired by the gruesome final events of the issue. Seeing that his pre-war council is proving anything but helpful, Doom decides to go shopping. Fortune tries to pressure Doom into revealing to her what secret he is holding back from everyone. Doom refuses because he is still hurt by her betrayal to the Neon Angel. 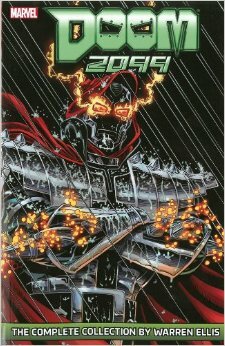 Traveling to a secluded part of Cyberspace, Doom enters the Ghostworks and enlists the services of Ghost Rider 2099 in order to recover an alien artifact that restores life to the dead. However Doom is not the only one after the artifact. Members from the Theatre of Pain, the X-Men, and Punisher, Spider-Man, and Hulk 2099 also converge to seek out the relic. After the fight for the relic escalates, The Theatre of Pain gain the upper hand and manage to use it to resurrect Mistress Wintre. Unfortunately for them, the Punisher kills her immediately after she is brought to life. In the end, Doom is left without the artifact which he planned to use in order to bring Poet back for Fortune.